Perfect for keeping your cooler in place. 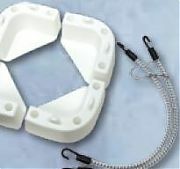 It secures the cooler to the deck or floor of your boat. Supplied with mounting hardware and tie-down bungee cords.